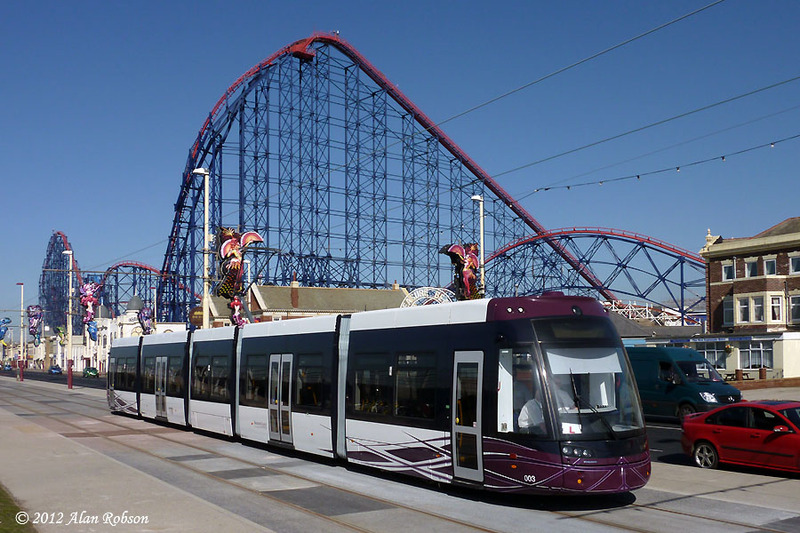 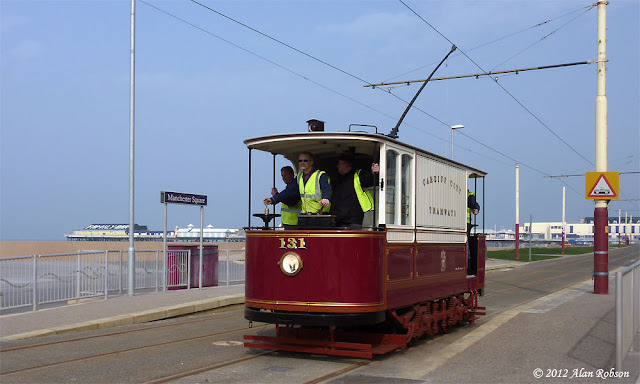 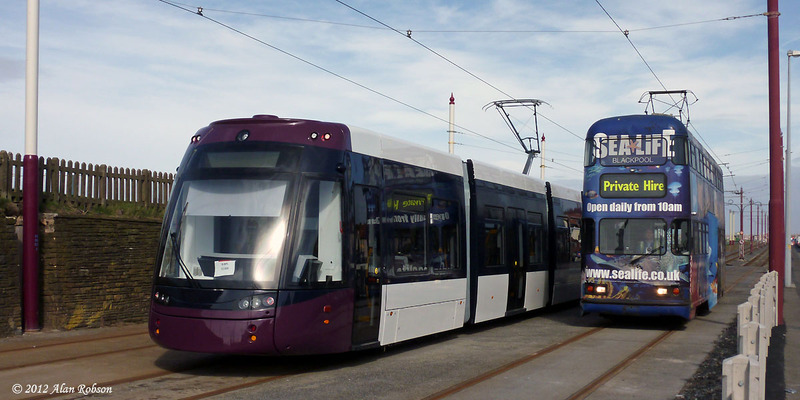 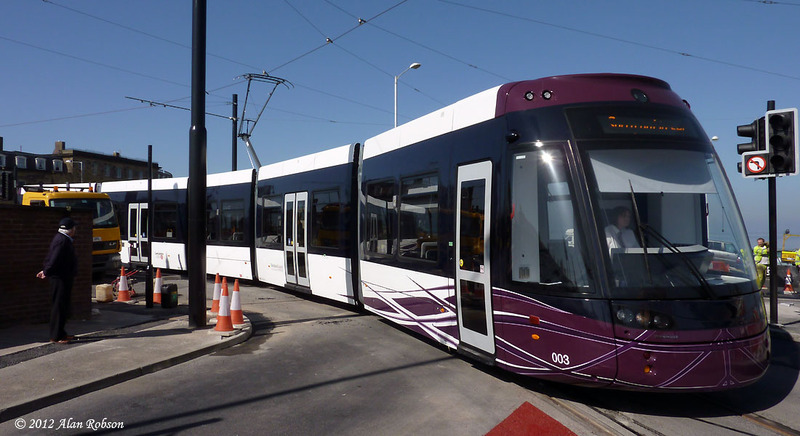 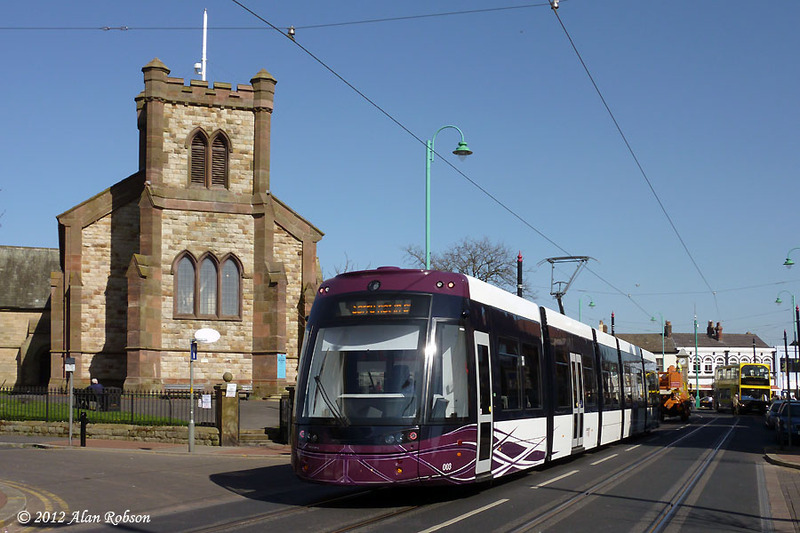 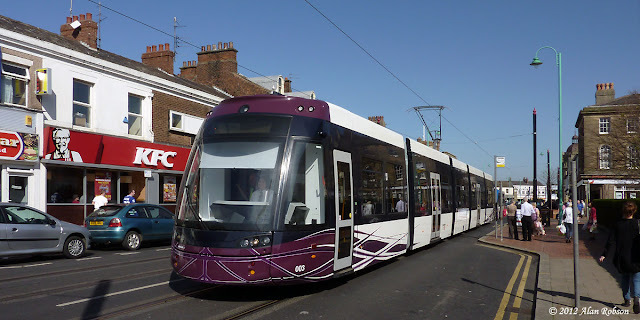 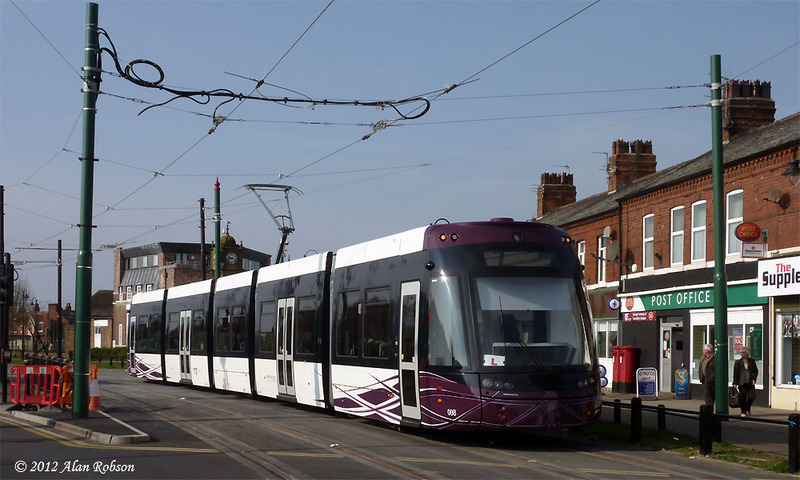 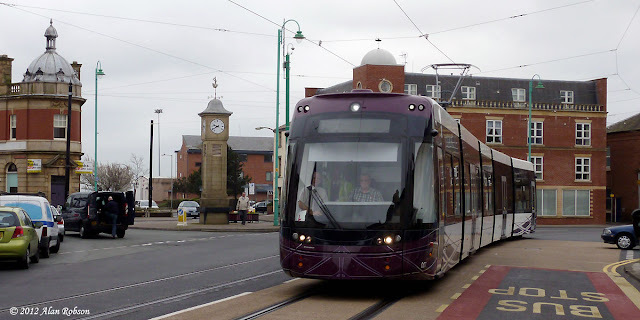 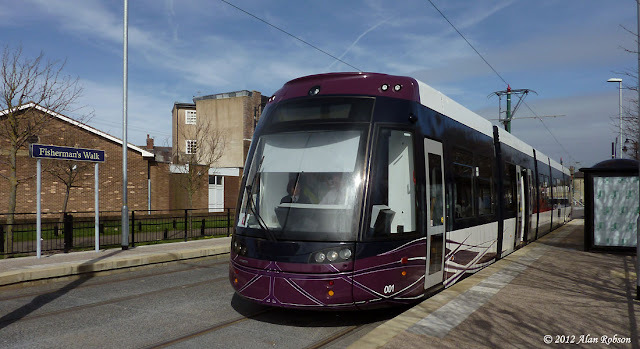 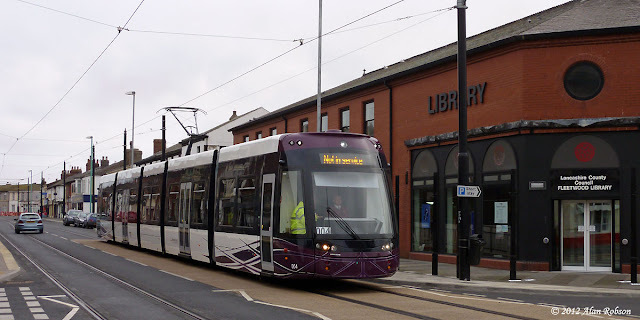 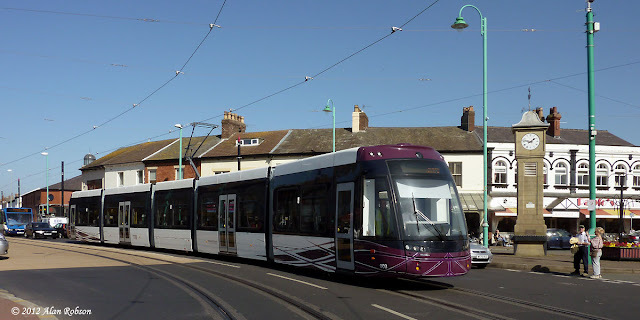 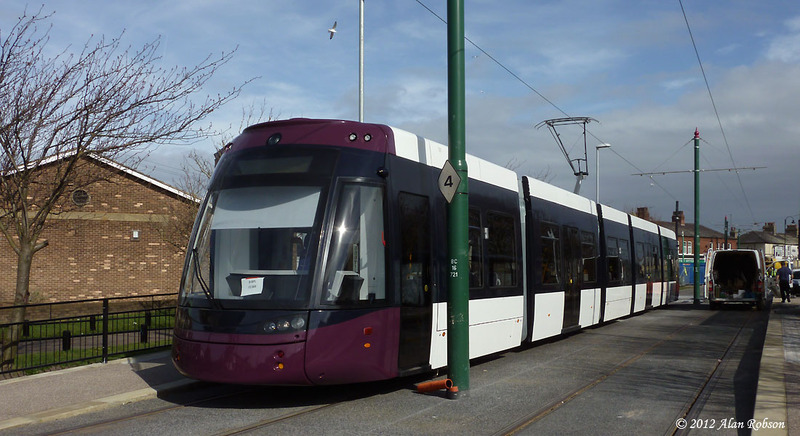 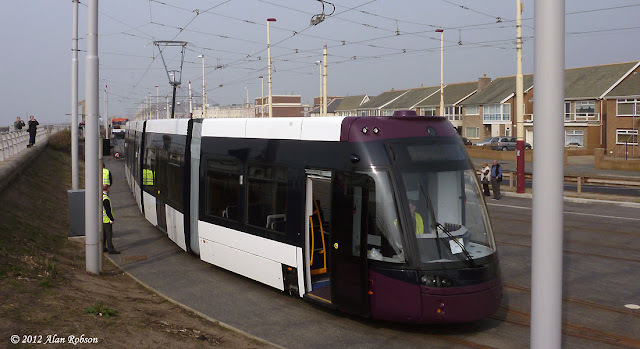 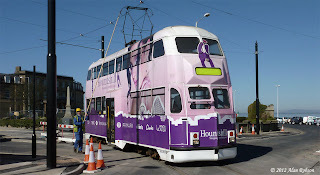 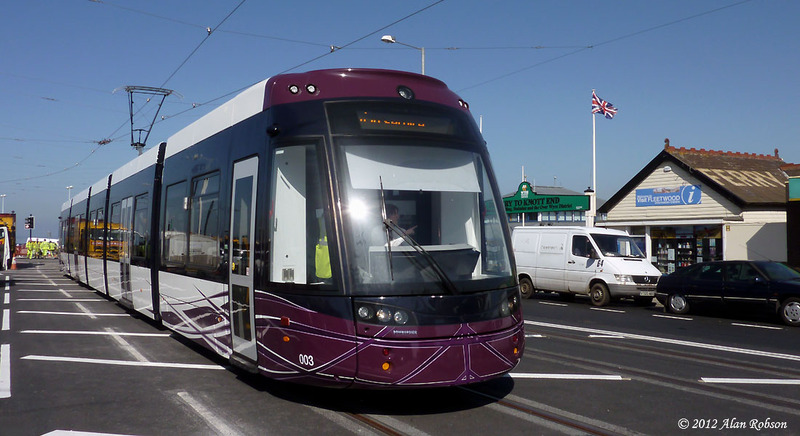 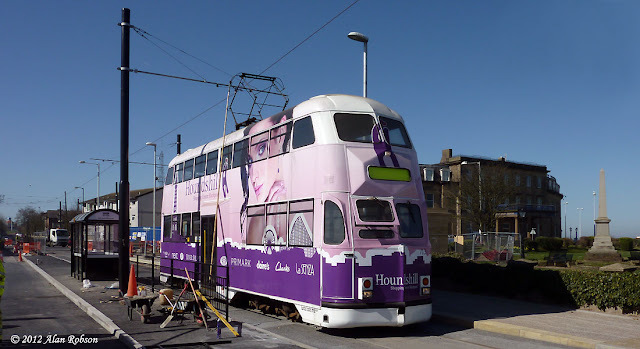 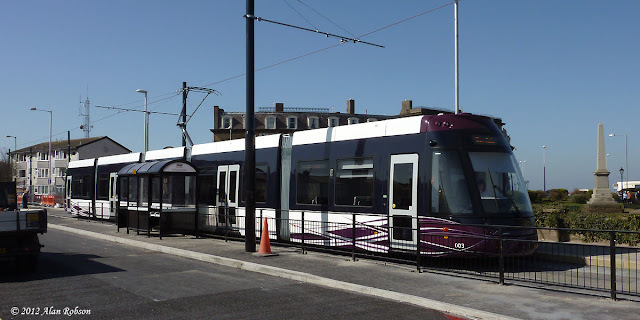 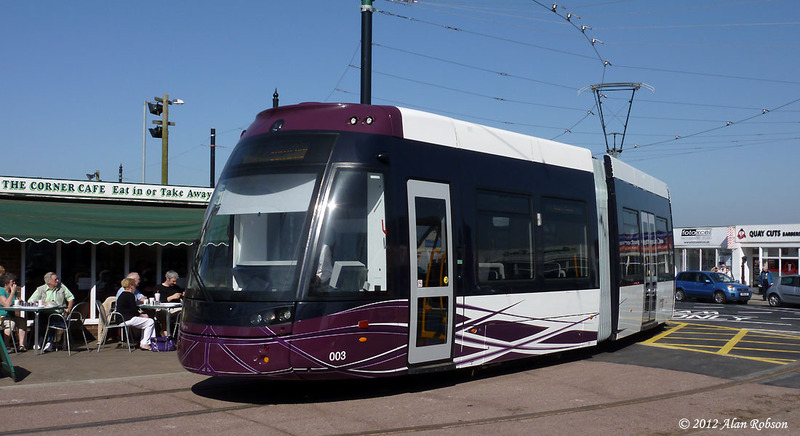 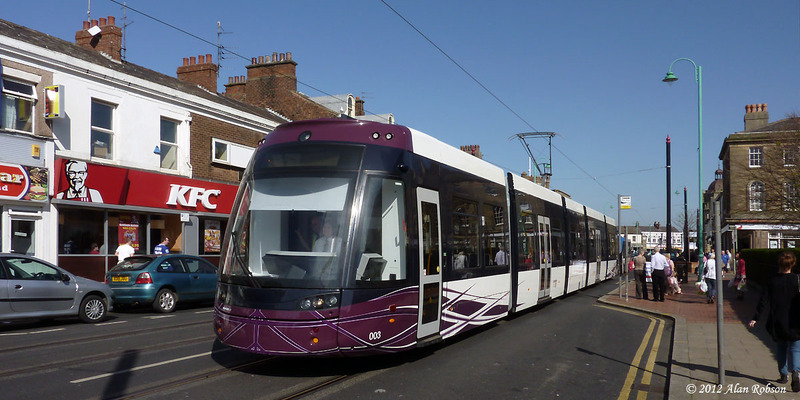 Following the successful testing of the track and overhead in Fleetwood on Tuesday by Flexity 003, and the inspection trip made yesterday using 009, the long awaited ghost service has finally commenced over the full length of the tramway, from Starr Gate to Fleetwood Ferry. 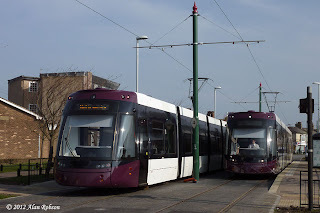 Between 09:00 and 10:30 this morning, Flexities 004, 008, 007, 002, 001 and 005 (in that order) were all noted making their debut on the streets of Fleetwood, and are pictured below. 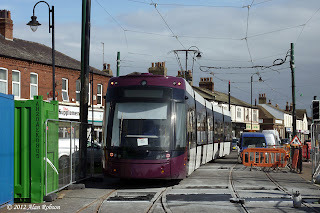 Flexity 009 made an inspection trip over the street track in Fleetwood this afternoon, arriving at the new Fleetwood Ferry tram stop in Bold Street just before 1.00pm. 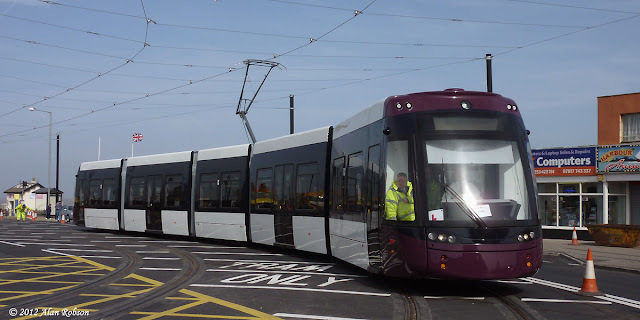 The outer loop at the Ferry was tested this time, two days previously 003 has used the straight through inner track on the inaugural Flexity trip to the Ferry. 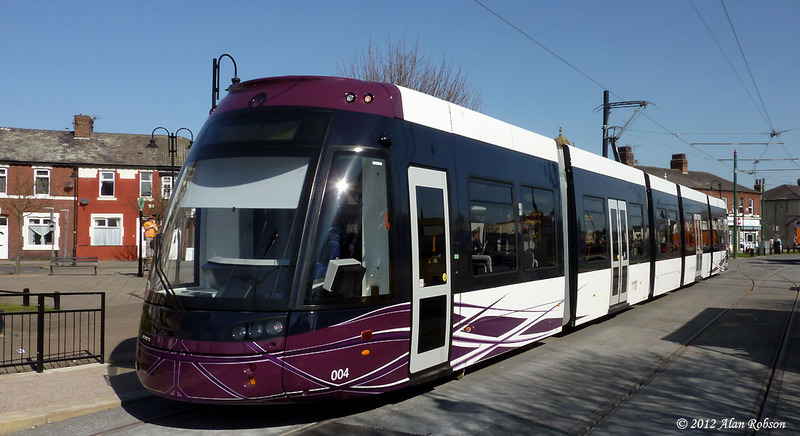 Flexity 004 made its debut today with full fleet branding, and is seen here at Fisherman's Walk in Fleetwood on a training run. 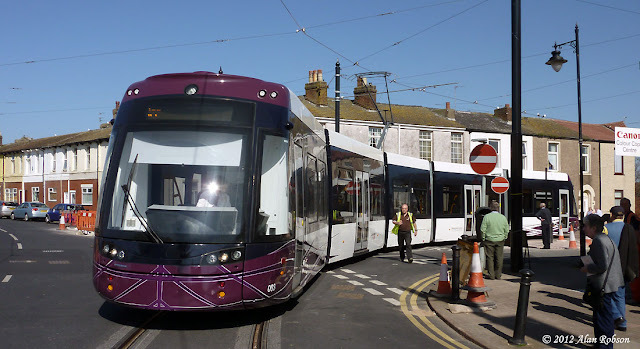 After yesterday's successful testing of the street track in Fleetwood by Balloons 709 and 713, 003 had the honour of being the first Flexity to make a trial run through to Fleetwood Ferry, arriving at the new tram stop in Bold Street at 1.30pm this afternoon. 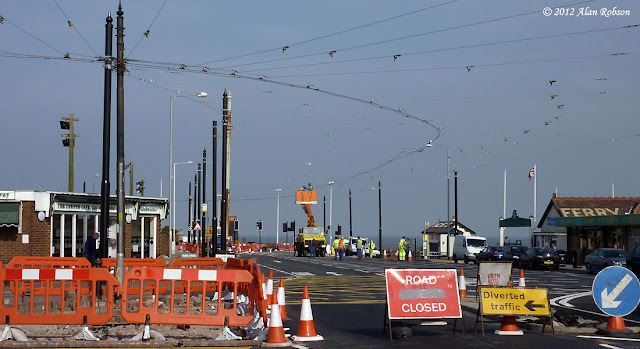 The Unimog and overhead crew had been in Fleetwood during the morning, making adjustments to the overhead and fitting new tie-bars over the crossover in North Albert Street near to Kent Street. 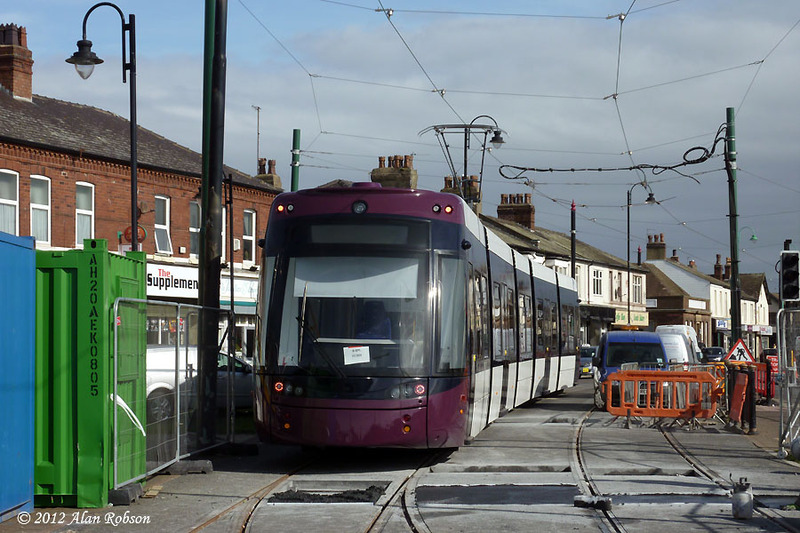 This work was all completed by 10.00am, but it was a full three hours later before a Flexity finally turned up to test the street track and overhead. Appropriately the tram chosen for this auspicious occasion was 003, which has only just entered driver training wearing full fleet branding. 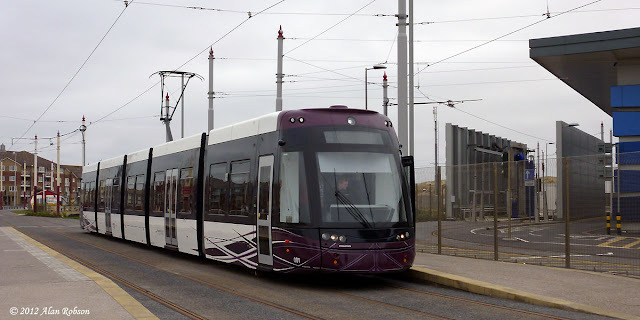 Flexity 003 was noted out on driver training today wearing full branding and fleet numbers. 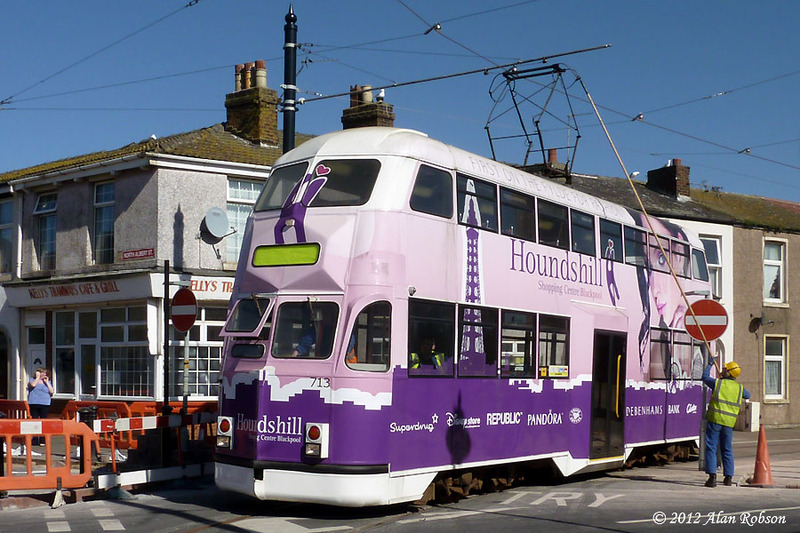 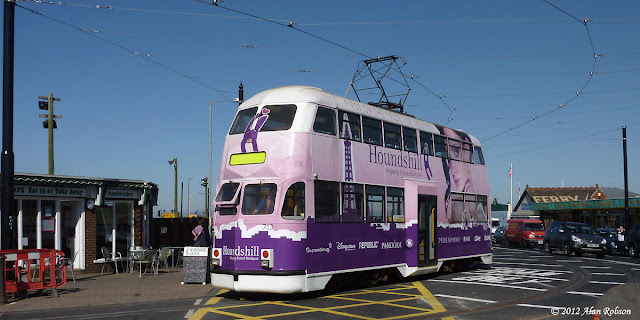 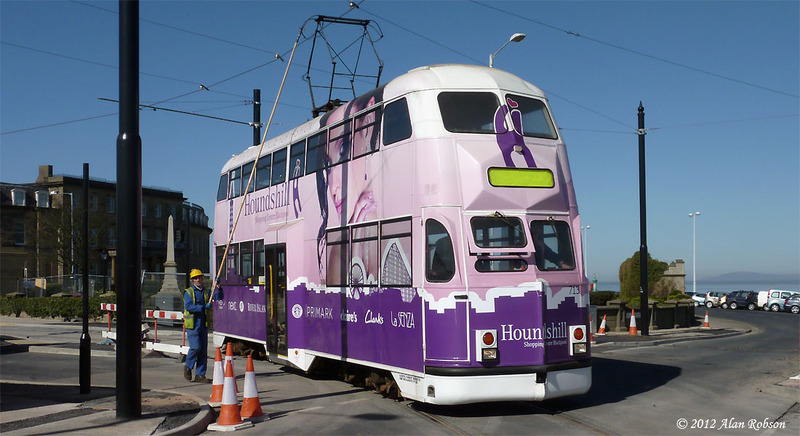 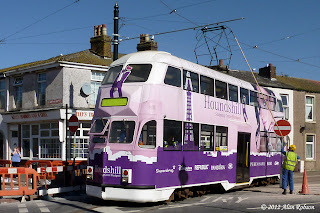 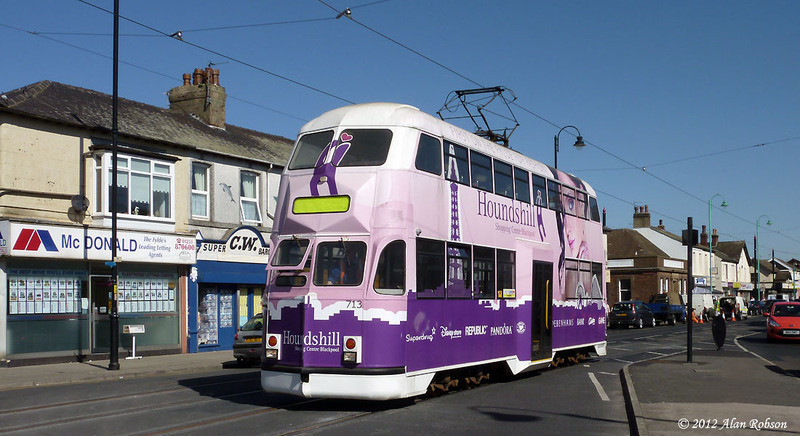 Today saw the return of trams to Fleetwood Ferry for the first time since 2009, when Balloons 709 and 713 tested out the track and overhead from Ash Street to the Ferry loop and back again to Ash Street. 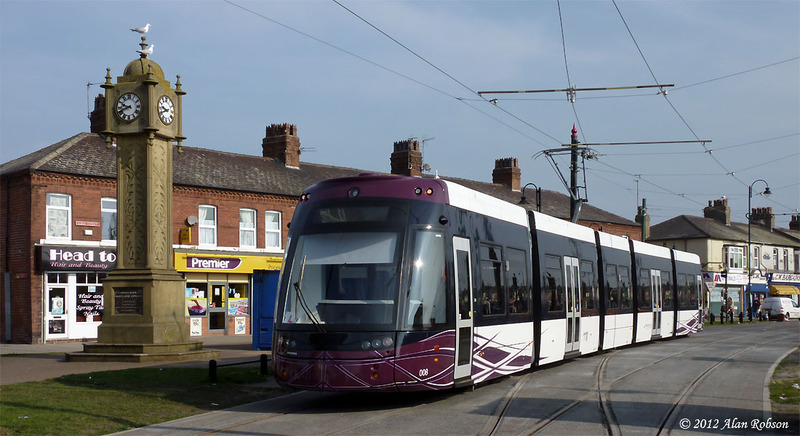 709 is seen rounding the curve from North Albert Street into Lord Street, being the first of the two trams to traverse the Ferry loop. 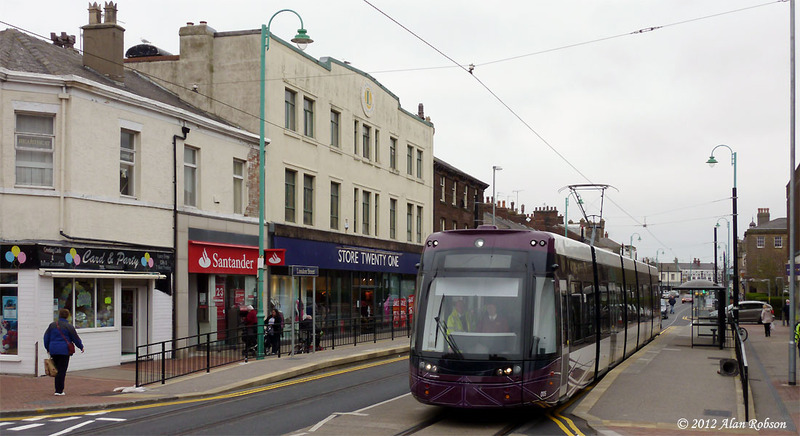 713 followed next and is seen above at the new Fleetwood Ferry tram stop in Bold Street, the name on the adjacent bus shelter reading "Bold Street Interchange". 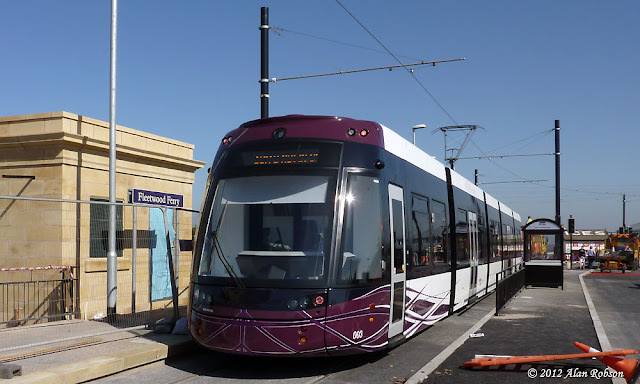 Passengers will no longer be picked up at the Ferry itself or in Pharos Street at the old cast iron shelter, the Bold Street platform being the only tram stop on the loop now. 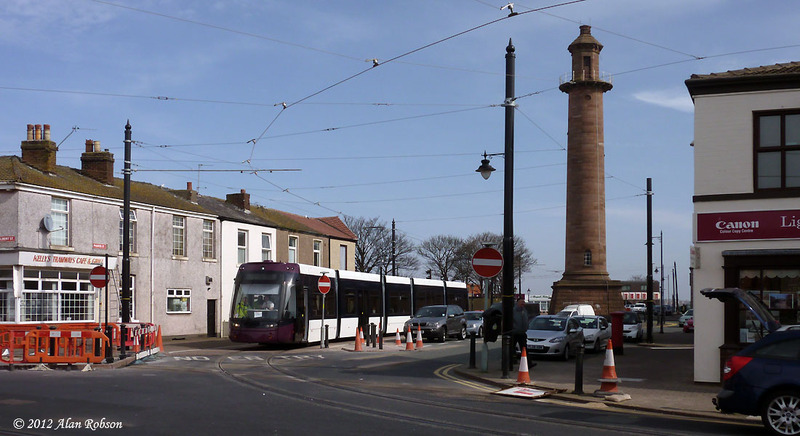 Both trams made a single round trip from Ash Street, 713 is seen above rounding the curve from the Ferry into Pharos Street. 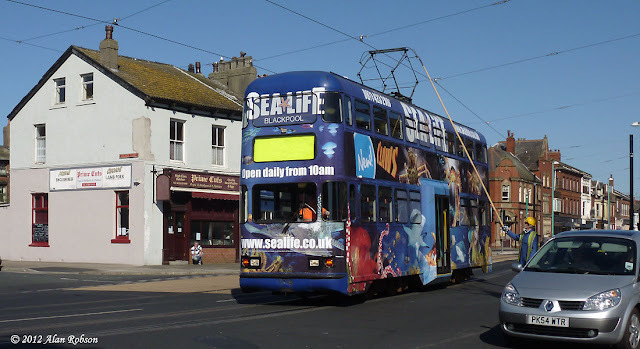 When exiting Pharos Street, the pantograph on 713 seemed to be at full stretch (see left). 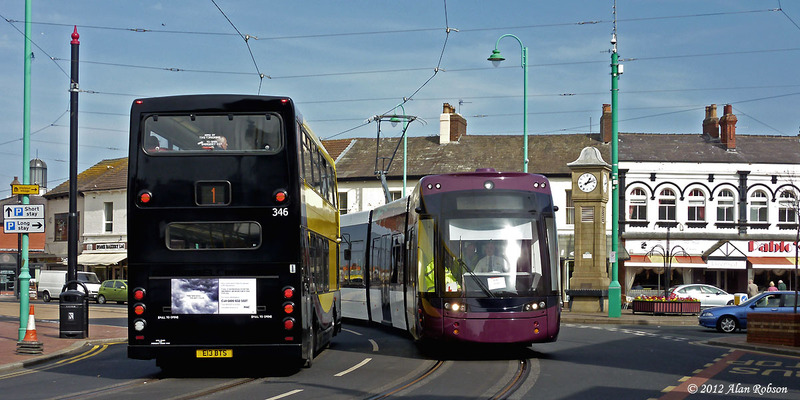 Both trams met up again at Ash Street, where after a crew lunch break they headed back south. Flexity 011 arrived at lunchtime today, following the usual pattern of Thursday or Friday arrivals, although its earlier than usual arrival caught some people off guard. 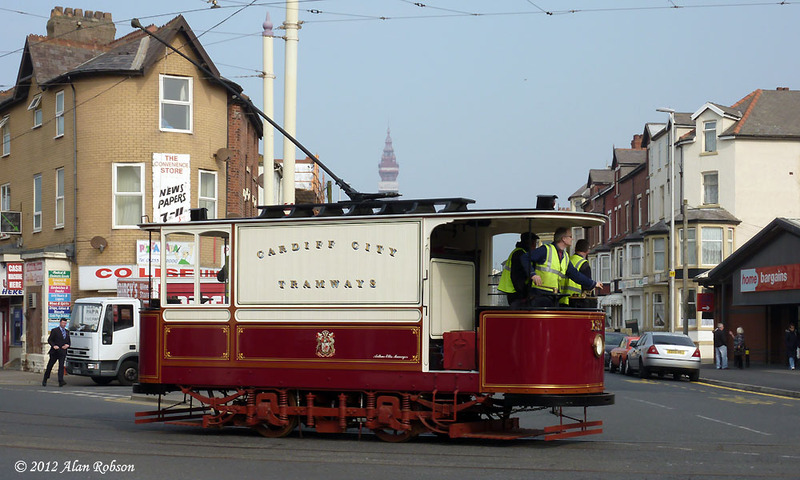 Cardiff water car 131 departed for Crich today, marking the end of its period of loan to Blackpool. 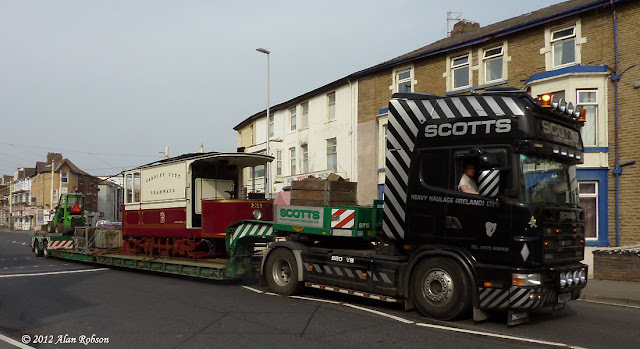 131 was driven from Starr Gate depot to the Tower, where it paused for photo opportunities before heading back to Blundell Street for loading onto the back of Scotts low loader. Cardiff 131 made two trips down Lytham Road today within the space of a few hours, the first time under its own power to take itself to Blundell Street, the second time at the start of a rather longer journey, on the back of Scotts low loader for the long trip home to Crich tramway museum. 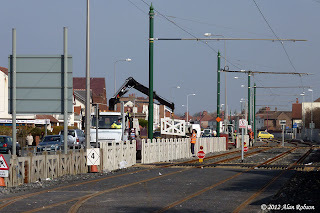 The steel fence enclosed work compound at the entrance to Lord Street in Fleetwood has now been cleared away, affording better photographic opportunities at this location. 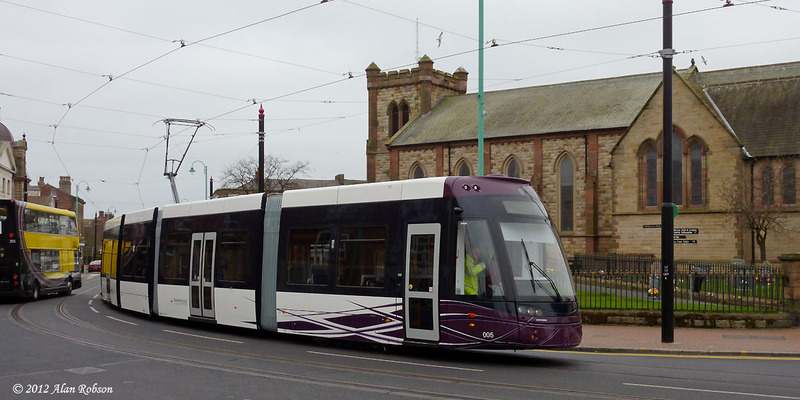 Early morning lighting enabled the above shot to be captured of Trident 330 passing Flexity 002 sat at the current northernmost limit of the driver training. The view at the left shows 002 having just arrived at Ash Street while Flexity 008 waits to head off south. 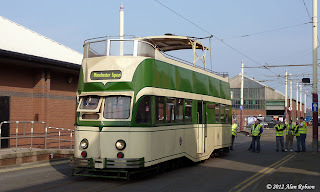 The big tram shunt that took place at Rigby Road depot two days ago has seen the Manchester Transport Museum Society owned all cream Railcoach 680 move to the front of the depot. 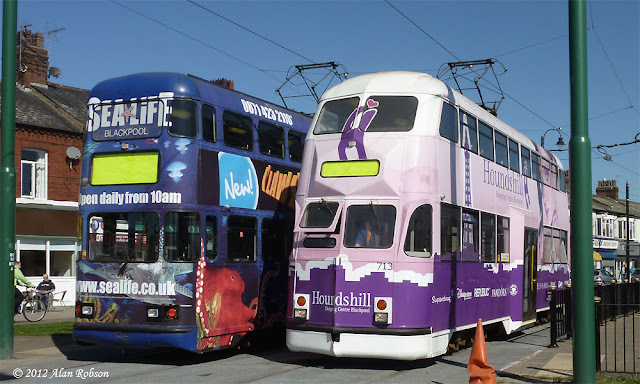 At the right is Unimog G262SCK that was loaned from AC Price Engineering to act as cover after Unimog 939's accident a couple of years ago. It could be a few days yet before trams reach Fleetwood Ferry as there is still quite a lot of work to do before all the overhead wiring is complete, the outer loop still only has hangars in place while the inner loop is currently being rewired. 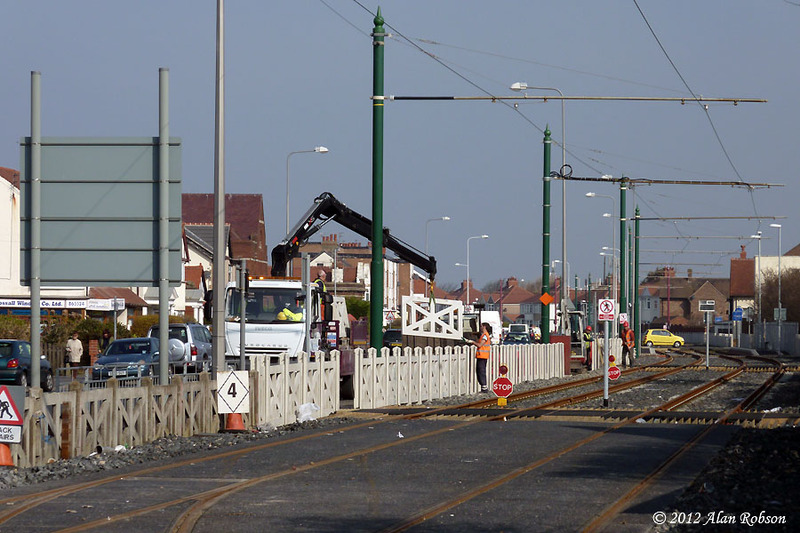 Fence replacement work is still ongoing at the northern end of the line to finally rid the reserved track sections of the old rusty and broken fencing panels that have been a feature now for many years. 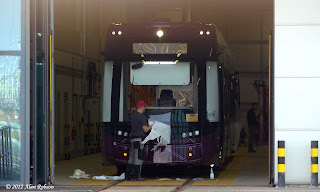 Flexity 005 was noted at Gynn Square today heading northbound decked out with full branding and fleet numbers, and at Starr Gate depot 003 was also in the process of having its new decals applied. The application of fleet branding appears to be on track in readiness for the launch of public service on April 4th. After the successful testing of the line from Thornton Gate to Ash Street by Balloons 709 and 723 yesterday, Flexity driver training has now been extended through to Fleetwood from today. 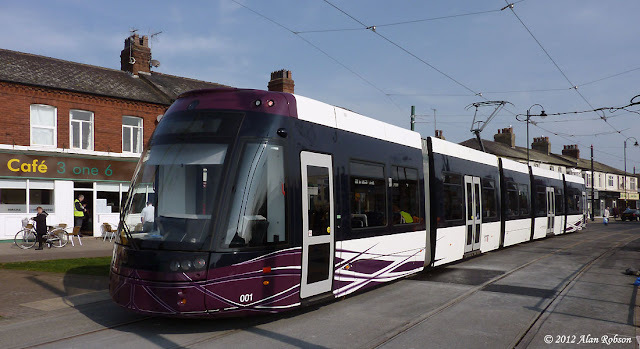 Very appropriately 009, the newest tram to be commissioned for the driver training programme, still with its Bombardier delivery paper stuck to the windscreen, became the first tram to reach Ash Street this morning. 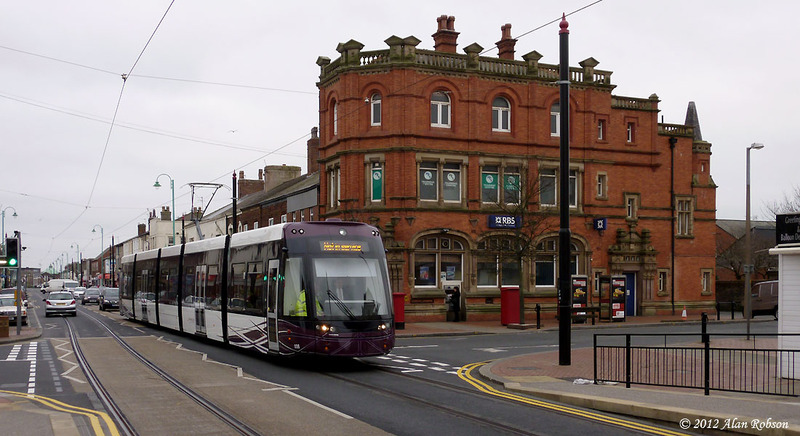 It is seen at the left, entering Lord Street to clear the points so it can reverse on the crossover. 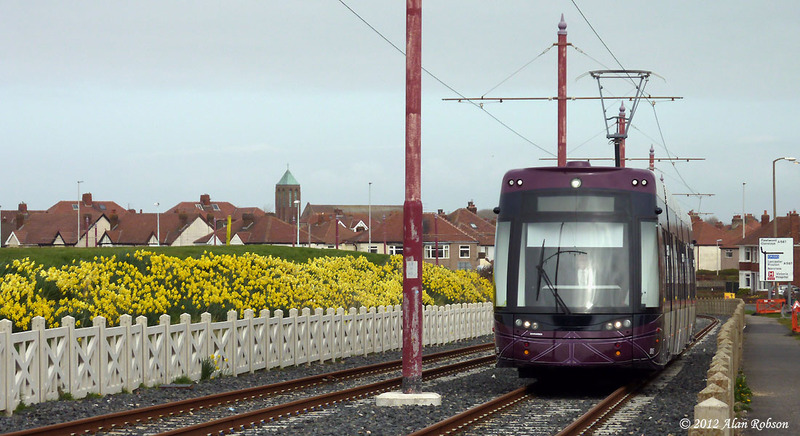 Flexity 009 reversed onto the centre track when it reached Bispham, being passed by Balloon 709 which was out on test, see photo at left. 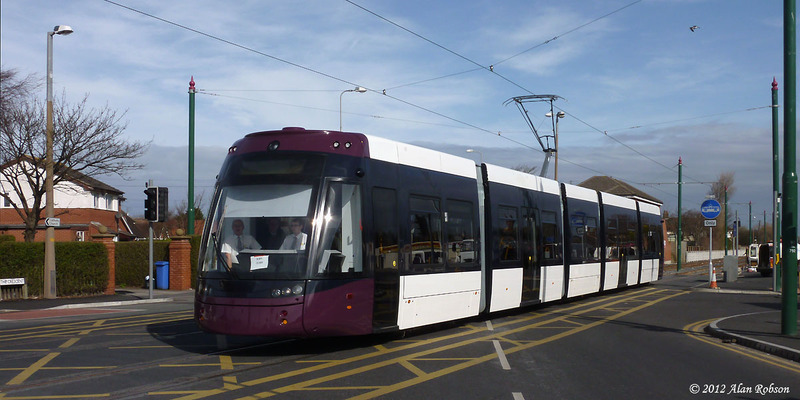 Perhaps it was also appropriate that 001, the inaugural Flexity 2, should become the second tram of the day to reach Ash Street, it is seen in the photo below at Fisherman's Walk.